Tokyo has lodged a protest over four Chinese coast guard vessels it says violated its waters near disputed East China Sea islands. The complaint comes a week after the Japanese Navy sent its flagship helicopter carrier close to waters claimed by Beijing. Four China Coast Guard ships sailed into the disputed territorial waters in the East China Sea on Saturday. The vessels stayed in the area near the contested Senkaku islands (otherwise known as Diaoyu in Chinese) for about two hours and sailed out before noon, NHK reported, citing Japanese officials. “Senkaku Islands are an inherent part of Japan’s territory and the invasion into the territorial waters was an unacceptable violation of Japanese sovereignty,” the Japanese Foreign Ministry said, as cited by the news agency. The Senkaku islets are controlled by Japan, but also claimed by China and Taiwan – which Beijing considers part of its territory. Tensions between the two Asian powers have heightened over the past few weeks, with both sides using their military assets in shows of force. On Monday, the Japanese Navy’s helicopter carrier, the Izumo, arrived in Singapore to begin a four-day journey in areas adjacent to the South China Sea. The maritime deployment was meant to send a message to Beijing and demonstrate Tokyo’s military might, Japanese naval commanders said. “We are not just here to show our presence, but from the outside that is what it looks like,” Rear Admiral Yoshihiro Goga, the commander of the mission, asserted, as cited by Reuters. The mission also involved officers from the Association of South East Asian Nations (ASEAN) who boarded the 248-meter carrier in Singapore on Monday. 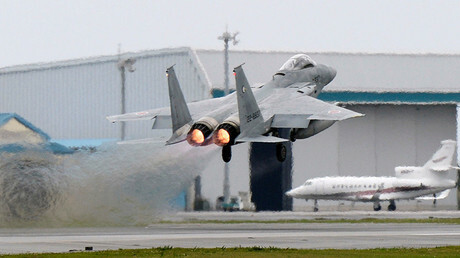 Other ASEAN military representatives were present at a separate three-day event in Japan to observe a disaster relief exercise conducted by the Japanese military. This was the first time Tokyo has staged high-profile events aimed at bolstering military-to-military ties with allied nations, Japanese defense officials said. 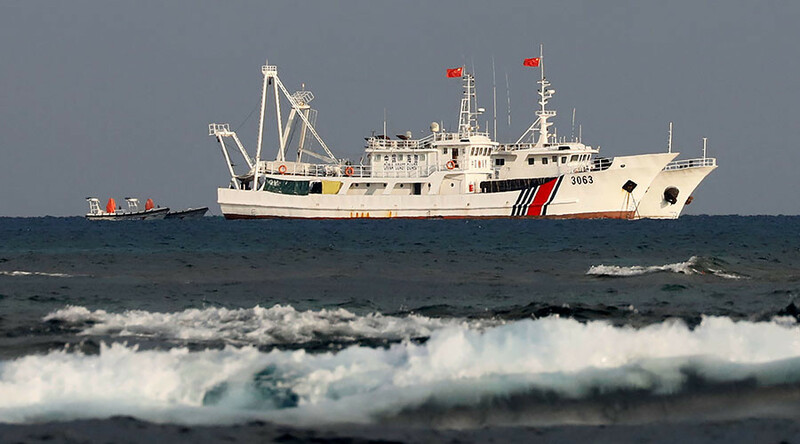 Another flare-up in tensions occurred in May when Chinese Coast Guard ships entered disputed waters and allegedly launched a surveillance drone. Japan scrambled two F-15 fighter jets, an E-2C early warning aircraft and an AWACS surveillance plane, to intercept the airborne target. The Chinese Foreign Ministry confirmed deploying the drone, claiming it was being used by some sort of “relevant media” for aerial photography. “This is not a military action, as has been hyped up by some media,” Chinese Foreign Ministry spokeswoman Hua Chunying said. “As for the so-called representations or protest by the Japanese side, of course we can’t accept it,” she added.